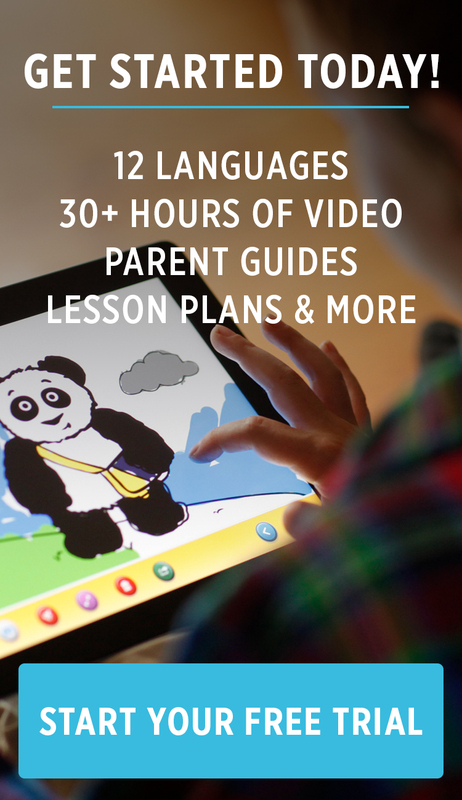 With Cinco de Mayo around the corner, it's the perfect time to start teaching your child Spanish! Cinco de Mayo commemorates the unlikely 1862 victory of the Mexican army over the French army in the Battle of Puebla. Celebrations around Mexico and the United States highlight Mexican culture, cuisine, and music. We've compiled a few Spanish vocabulary words that follow the theme of the festivities, as well as 4 fun ways to teach your child Spanish! Little Pim's Spanish Bop will have your whole family singing while learning Spanish at the same time! And don’t worry if you don’t know Spanish–the album comes with a 16-page lyrics book that highlights vocabulary from our Spanish video series and includes an English translation of all the songs. Incorporating Spanish music in your lessons is definitely helpful for gaining your little one's attention and makes language learning fun! Research reveals that the mind is able to process visuals 60,000 times faster in the brain than textual information. Simply put, your child will learn more quickly and effectively when visuals are a big part of the learning model. By utilizing pictures, flashcards, videos, and board books, the information will solidify in his/her mind. Everyone loves a fun game. Furthermore, for the tactile learner (which is the child who learns through touching and doing), games are a tremendous way to connect positive experiences with the act of learning the language. Depending on the age of the child, you will have to modify the games. Here are a few suggestions for an older child. Once the child knows a few basic words (learned from the Little Pim videos or flashcards), set flashcards on the floor in a path leading to a surprise, treat, or just a big hug. The object of the game is the child says either the word in Spanish or tells you the translation (what it means in English). As they advance along the path, they pick up the cards and if they get the right answer, they move on to the next card until they win by reaching the end. A variation of the game above is to use the flashcards, but for each one that the child gets right, he or she can put a stuffed animal in the “zoo” (a sectioned off area you designate to be a zoo) to be with all its friends. When she gets all the animals in the zoo, then the game is over. Play a Spanish song that your child knows pretty well, then periodically pause the CD for your child to fill in the missing word. To add some child fitness exercises to the mix, you could make learning new words into an action game. For each word your little one is able to say, they get to do a jumping jack, hop like a bunny, or some other fun action your child enjoys! Learning about the Spanish culture, experimenting with Mexican foods, and even taking a trip to Mexico are also wonderful ways to immerse your child in the experience of the Mexican culture. As the child identifies with and learns about the culture, he or she will have a more well-rounded educational experience. Learning the Spanish language is an asset for children. Making it enjoyable goes a long way in making it stick in the child’s mind. At Little Pim, we produced the #1 language learning program for kids ages 0-6 and products such as flashcard sets and board books to make language learning fun for little ones.